Just saw this on Facebook today. Makes a good point in a way, but with so many problems. First the good: The top row does have some parallel values. Of course, there's no lecture in the factory and there's no work being done in the sanctuary, but the perfunctory nature of how large groups can be organized and basically herded for the sake of creating efficiencies which happen to favor the ruling power - without question, that absolutely applies. Now, the bottom row only displays two types of circles but the living room circle (small group, cell group, house church, etc) fits so well that it's obviously what's being implied. Of course, again, there's [often] no work being produced in the third group, which typically also displays very little of the focus, or direction, or (ironically) collaboration, all three of which are characteristically to be found in classroom group work and corporate team projects (at least in theory if not always in practice). Finally, yes of course the vertical change in all three columns does reflect what has actually been happening somewhat gradually (in some places more rapidly than others) for the past few decades. The public school system, corporate org charts and institutional christendom have all embraced some degree of innovation in how to... well, in how to do what they do. Let's just leave it at that. Now the bad: First, the cathedral dynamic pre-dates both public schooling and factory work by twelve to fifteen centuries or so. 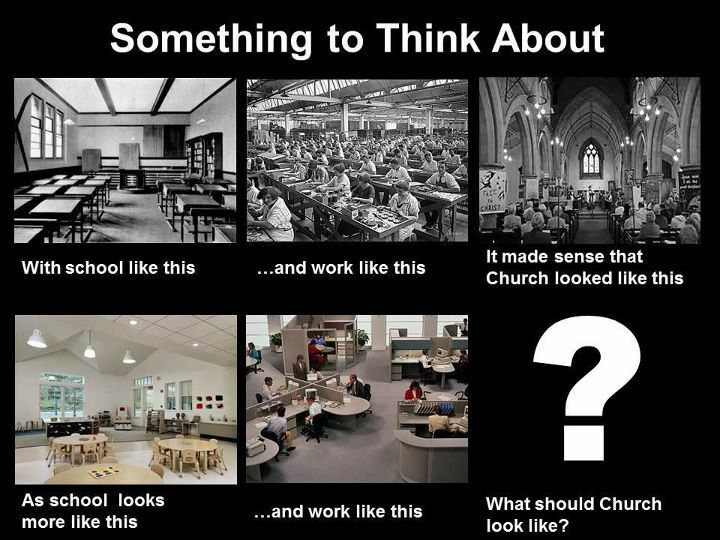 Last I checked, the industrial revolution is what led us to urbanization, factories AND public schooling, but Organized Sunday Service was doing its thing long before, so - good or bad - there's no real comparison here for what's being implied. Second, if the sixth block were to be filled in, would it look much different from the third one, really? The worst thing about pew sitters (that is, about the kind of pew sitters I mean to critique here, which is not necessarily *all* pew sitters; ahem) is their passivity. But for the most part, small group s.y.i. sessions are often just as passive, although they do tend to be a much more chatty form of not-really-doing-anything, naturally. This is not the point, not the goal, and not the reason Christ died - or lived - here on the Earth. 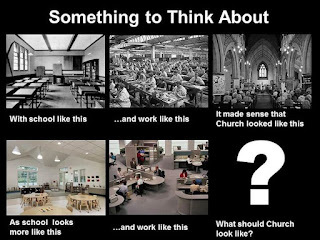 I don't feel like this graphic expresses well what we ought to be really passionate about, when discussing reasons why and possible ways in which local churches might do well to experiment with different forms and functions, styles and strategies, methods and missions. "Something to think about"? Yes, indeed so. Absolutely. Except for all the times when it's worse. When was Paul's "Cornelius Moment"?